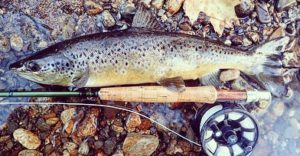 As of the middle of this past week, there were still a few salmon around in central Mass. I did a very short after work trip midweek, saw about a half dozen salmon and caught four (three males and one female). The hen was clearly post-spawn while the males, though still milting a bit, seemed to me to be in post-spawn condition. I caught everything on a small tan zonker. Luckily, they were pretty active and hungry because I had forgotten my pack and the streamer was the only fly I could scrounge up out of the deep recesses of my jacket pockets. The salmon were holding in the slower, deep runs. The water was exceptionally clear, and, the fish were pretty skittish. So, I took to hiding behind a tree on the bank were I could see them. After that, all it took was a good drift down towards their lie, then a little twitch of the streamer when it got close. The salmon weren’t moving far but they were definitely interested in the streamer, striking without hesitation when it got within a foot or so of their lie. Being post-spawn fish, the fight left a little to be desired (especially considering how hard these guys fight in pre-spawn glory). So, I played them quick and released them so as not to deplete their already low energy reserves. There were redds all over the place. So, if you are fishing for salmon, please try to avoid disturbing these. 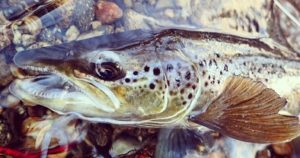 The Wachusett Landlocked Atlantic Salmon fishery is almost entirely supported by wild reproduction. Great post, curious what would have been your game plan had you not forgotten your pack? Maybe a smaller streamer, bead, and nymph would’ve all been in play. For whatever reason I don’t usually fish the bigger streamers for salmon, especially in such low, clear water. Note that I’m new to salmon so still learning even just the basics. So humble! I think you’re in the Big Leagues already! 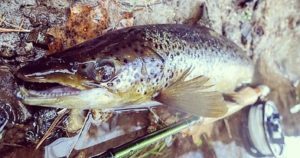 A fly that worked for me all winter on landlocked salmon the year they washed over the spillway and into the Swift River was the Partridge & Orange soft hackle in sizes 14-18. You just had to get the fly close to the fish’s jaw. Watch for the head to turn slightly and gently lift the rod tip if they did turn. Then game on! Was a winter fishing to remember!